This room accommodation at our Ortigas condo-hotel feature a combination of elegant interiors, familiar comforts, and calming colors, creating a positive vibe that sets a perfect mood day and night. 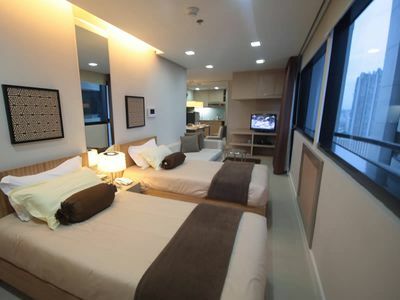 And in addition to these, also present are amenities that guarantee a convenient stay. BSA Twin Tower Condotel, the Tallest Twin Towers in the Philippines, located at St. Francis Square behind SM Megamall and experience a revolution in city living. It is conveniently located at the St. Francis Square, Ortigas Center which puts you minutes away from leisure destinations, commercial and business establishments to suit your lifestyle. With the landscaping plans by the National Artist and Father of Philippine Landscape Architecture Idelfonso P. Santos, the 55-storey condominium allows you to enjoy the thoughtfully-designed amenities that will cater to your lavish taste and ensure grandeur experience at good value for money. The fusion of convenience and refinement is translated to carefully-appointed units, gym fitness centers, indoor rock pool, childrens playground, lobby lounge and a lot more.